Synopsis: It has been a very busy Summer for Sarah and me, with a combination of work and planning for our wedding! We were long looking forward to an enjoyable weekend of backpacking over Labor Day up in the Desolation Wilderness in the Lake Tahoe Basin and had a trip all planned. However, the horrible Rim Fire in Yosemite has been blowing smoke up in a direct line towards Lake Tahoe, making for some pretty rough air conditions. I actually had triathlon scheduled in Lake Tahoe in the weeks prior to Labor Day that was cancelled due to unhealthy air quality. As an aside, a special thanks to all of the fire service workers that are out trying to control the Rim Fire. It is a massive undertaking and will be really interesting to see the effects heading into Yosemite next year. Needless to say, Sarah and I were looking for a different plan and decided to head up to the Trinity Alps Wilderness in Northern California near Mount Shasta. I had never explored the area, but it has been high on my list for a while given the size of the wilderness area. The Trinity Alps Wilderness is actually the second largest wilderness area in California – it currently has over 600 miles of trails and embraces over 500,000 acres of land. Sarah and I decided to hike into Granite Lake via the Swift Creek and Granite Lake trails. Our plan was to drive up Saturday afternoon and car camp in Preacher Meadows camp, which is relatively close to the Swift Creek trailhead. 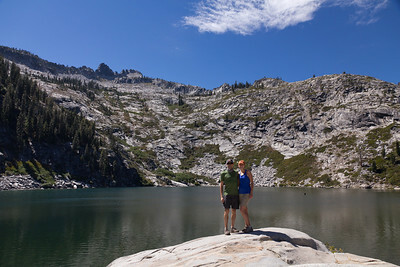 Then on Sunday morning we would wake up early and hit the trail to hike up to Granite Lake.